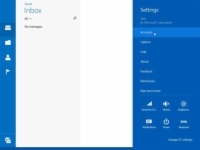 1From the Start screen, click Mail. 2Select the Settings charm to open the Settings pane. To select the Settings charm, you can move the mouse to the bottom-right corner of the screen until the Charms bar appears and then click the Settings charm, or you can swipe in (on a touch screen) from the right and then click Settings. 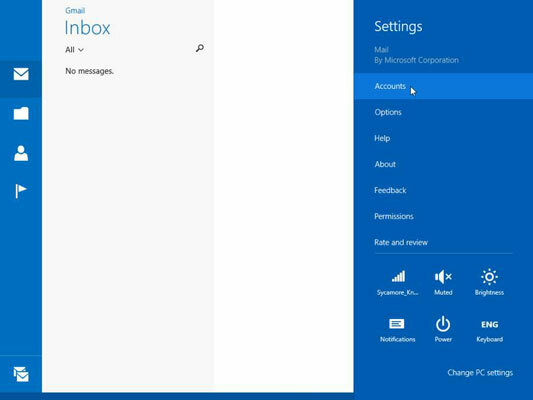 A list appears of the mail accounts already set up, plus the account you use to sign into your Windows account (regardless of whether you use it to send and receive email on this PC). A list of some of the most common email services appears. 5If your email provider appears on the list, click it and then follow the prompts to finish setting up your account. 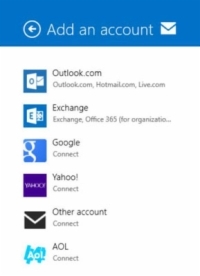 If you have a Hotmail or Live address, choose Outlook.com as the provider. If you have an EAS or IMAP account, click Other Account and then follow the prompts to finish setting up your account.